AMBER LOVE 06-SEP-2012 Joining VODKA O’CLOCK are writer Philip Gelatt and artist Tyler Crook who teamed up on the graphic novel PETROGRAD published through OniPress. The kitty that chimes in is not Caico. She’s too mic-shy to be on the show. Philip found the historical figure RASPUTIN to be fascinating from a young age talking to his grandmother. The notions of how difficult Rasputin was to kill birthed the thoughts that it would be interesting to cross him over in JAMES BOND but Philip doesn’t utilize the Ian Fleming icon. He sets Rasputin against an original British spy. Rasputin is the central character but Philip finds it difficult to dub him a protagonist or antagonist. In a time when it would not be too strange for a person of power to seek spiritual advice, Rasputin wormed his way into the life of Tsarina Alexandra of the Romanov Dynasty. Like many comic book artists, Tyler got the bite at a young age. His career path, however, steered through video games. He was able to leave game design behind and move into making comics full time. Phil comes from a film background and realized that it was more reasonable to pair with only one other person to make his comics rather than the massive team and financing it takes to make a film. Philip gave Tyler the breathing room an artist can appreciate. He used economical panel descriptions and focused more on the dialog. Why not go with commercially successful superheroes? Philip’s influence comes from Alan Moore’s FROM HELL although he doesn’t aspire to create such an intensely dense tome. Phil explains his displeasure with the new reimaginings of placing mutants into historical events that are genuinely fascinating in their own right. We enjoy a lively discussion about how ill-informed the populous is on history taking for example all the Twitter feeds by users who didn’t know that the Titanic sinking was real. He feels the same about zombies which coming from a huge DAWN OF THE DEAD fan, pained him to reveal. The commercial market is saturated by original and reinvented zombie stories. Will Rasputin’s lore evolve as Vlad Tepes (Vlad the Impaler) did from the single work of Bram Stoker? Are there other any examples from our time that seem to be taking a real public figure in this direction as well? Philip said the closest he can think of is the Church of Scientology founder L. Ron Hubbard. Rasputin is such an iconic occult figure, there’s certainly a possibility that in 500 years there will be a cult to him. Tyler and Philip agree that you need to work on your craft every day to meet your own expectations for improving and evolving as an artist. Developing your style comes with improving on the skills. (Around 1:00:00 mark) Lastly we get into a discussion brought about the TerribleMinds blog of author Chuck Wendig. Are trailers a good use of promotional tools for books? What works? What doesn’t work and why? We also created some homework for you, Listeners! 1.) You have a writing prompt: Write a short comic script using only emoticons and see what an artist comes up with. 2.) 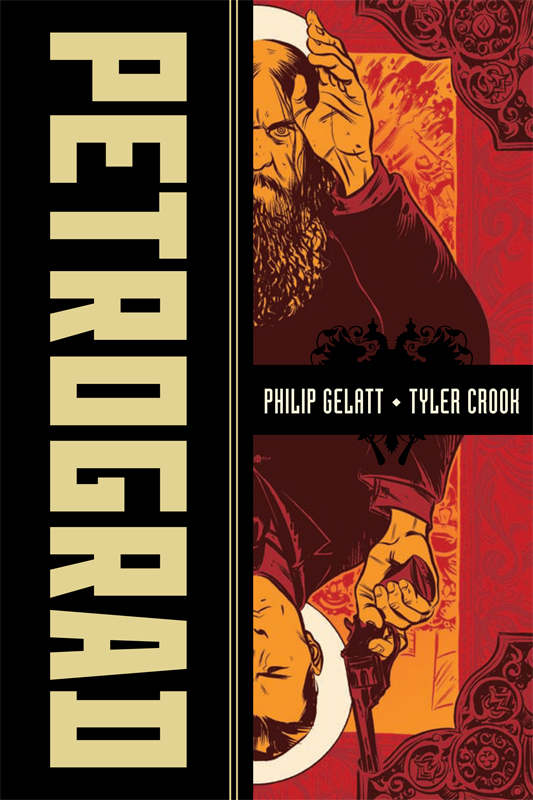 If you’re Russian and have read PETROGRAD, please send in your feedback. * AND IF YOU’RE REALLY CURIOUS, here’s a link to Rob Liefeld Levi’s commercial we mentioned.